Tales of shining cities, crocodile gods, and lost knowledge. Assassin’s Creed Origins lets you step back in time and experience the twilight years of ancient Egypt. The line of pharaohs is coming to a sorry end, Greek and Roman culture is rapidly sweeping across the desert, and the old gods are being abandoned. Monuments, cities, and temples litter Origins’ immense world map, all of which have a long, rich history far beyond what you experience in the game. Here are some of their most fascinating stories. The Egyptian crocodile god Sobek was associated with fertility, power, and military prowess. He was worshipped by the Cult of Sobek in ancient Faiyum, in a city christened 'Krokodilopolis', or Crocodile City, by the invading Greeks. The city was famed for the sacred pond in the Temple of Sobek where a giant (and, if legend is to be believed, tame) crocodile adorned with jewels and gold was kept and paid tribute to. Bayek visits the city in Origins and is asked by a local priest to find out why the sacred beast has suddenly begun weeping blood. With giant statues of Sobek lining the streets, you can only imagine what the Greeks thought of this incredible place when they first discovered it. The ancient Egyptians weren't always master pyramid builders. The so-called Bent Pyramid is an early attempt, commissioned by the 4th dynasty pharaoh Sneferu around 2600 BC, and could owe its odd shape to the unstable ground it was built on. A popular theory suggests the increasingly heavy pyramid began to sink into the sand before it was finished, forcing the builders to sharply shift to a shallower angle at the top. One of Bayek's targets is hiding out in the pyramid's inner chamber in Origins, giving you a rare chance to venture inside. A smaller satellite pyramid was built 55 metres south of the Bent Pyramid to house the pharaoh's Ka, or vital essence, which also appears in the game. Sailors who saw the grand Greek (and later Roman) city of Cyrene from the sea described it as 'the white shining breast.' And with its gleaming marble temples and statues glinting in the sun, it must've been quite a sight. Nicknamed the Athens of Africa, Cyrene was the seat of the Cyrenaic school of philosophy and was famously defensible thanks to its location among the high, rugged mountains of modern Libya and abundant water sources. You can visit the crumbling ruins of the city today, but in Origins you get to experience the place in its heyday. It's one of the most impressive locations in the game and Bayek can earn some extra coin there fighting in the gladiator arena. One of history's greatest tragedies is the destruction of the Royal Library of Alexandria. Dedicated to the Muses, the nine goddesses of the arts, this was a vast temple of knowledge and a research institute, packed with hundreds of thousands of scrolls charting the history of the ancient world. But after several wars, invasions, and uprisings, the library and its priceless contents were destroyed—although there are conflicting theories about who was actually responsible. Bayek visits the library in its prime and finds the halls filled with scribes and the shelves lined with scrolls. Visitors to Alexandria were obliged to surrender their books to be copied and stored in the library. One of the most famous places in ancient Egypt, Giza was a necropolis for the pharaohs. The plateau is dominated by three iconic pyramids, including the legendary Great Pyramid, which was the tallest structure in the world for over 3,800 years. The pharaoh Khufu is widely believed to have commissioned this impressive building, although the irony is that, other than this, there are very few details left about his life and reign. Despite the fact that Origins is set many years after the Great Pyramid was built, it's in much better shape than it is today. You can still see the white, polished limestone casing stones that used to surround it, and the striking gold pyramidion at the top. Memphis was once the capital of the Old Kingdom, strategically positioned at the mouth of the Nile delta. For years it was a thriving centre of trade, commerce, and religion in ancient Egypt, and was believed to be protected by Ptah, the god of craftsmen and architecture. Memphis also had close royal ties, being the place where the pharaoh would receive the Pschent, or double crown: an important symbol of a unified Egypt. But Memphis' glory didn't last thanks to the steady rise of nearby Alexandria and its decreased religious significance as the old gods were abandoned. 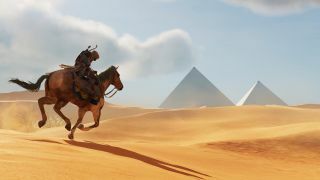 Bayek visits Memphis several times in Origins and finds a city already beginning to lose its prominence. The Great Sphinx is one of the defining images of ancient Egypt, although not much is known about it. Carved from limestone near the Great Pyramid, it's believed to depict the pharaoh Khafra, although some disagree. No record of the statue's construction has ever been found by archaeologists. The Great Sphinx is carved into the bedrock of the Giza plateau; the same place where the stone used to build the Great Pyramid was quarried. The statue is in a pretty sorry state today, but in Origins we see the nose and ceremonial pharaonic beard intact. Bayek comments that it's smaller than he expected, a common remark from people who see the Great Sphinx in person. Death was an important industry in Egypt, and the sacred mummification process required a number of materials, including a salt called natron. This naturally occurring substance was extracted from dry lake beds and was used as a drying agent in the preparation of bodies for the afterlife. Bayek visits a natron mine in Origins, in a place called Nitria, where you can see hundreds of workers, hands caked in salt, mining chunks to be delivered to cities like Memphis for use in mummification. And overlooking the mine is the ever-watchful statue of Anubis, the god of death and embalming, who you occasionally see priests praying to, perhaps for a bountiful harvest of natron.